Occasionally, there are times when a release has been delivered to DSPs and is currently available to the public, but you now would like to be removed. In this case a takedown may be issued for any release to remove it from any or all services. Some typical reasons for issuing a takedown for a release might be if the rights have been transferred to another party, or if the release will be handled by a new distributor. Further, if the artwork or audio file(s) for a track or release needs to be replaced, a takedown will need to be issued. For errors in metadata text however, corrections can usually be made and pushed directly to DSPs without issuing a takedown. Click here to learn more about updating metadata. Revelator has a simple takedown process for releases that are publicly available on at least one DSP and should be removed. All files, metadata and associated contracts will remain in Revelator for future use after issuing a takedown notice. To issue a takedown, start by navigating to Distribution from the main menu, and then select the Live tab to view all releases currently delivered to DSPs. Search for the release or releases you would like to remove using the search tool. Select all releases to be taken down by click the checkbox to the left of each item. Click Options and then Request takedown. A confirmation dialogue will appear. 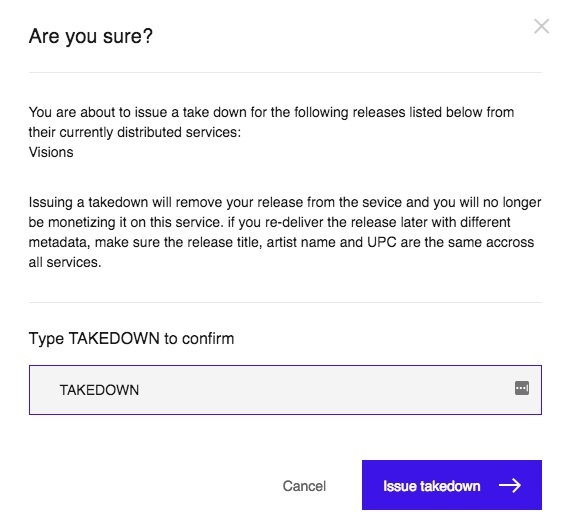 Confirm that the releases are the ones that should be removed by entering the word TAKEDOWN in the text box, and then click Issue takedown to finalize your choice.